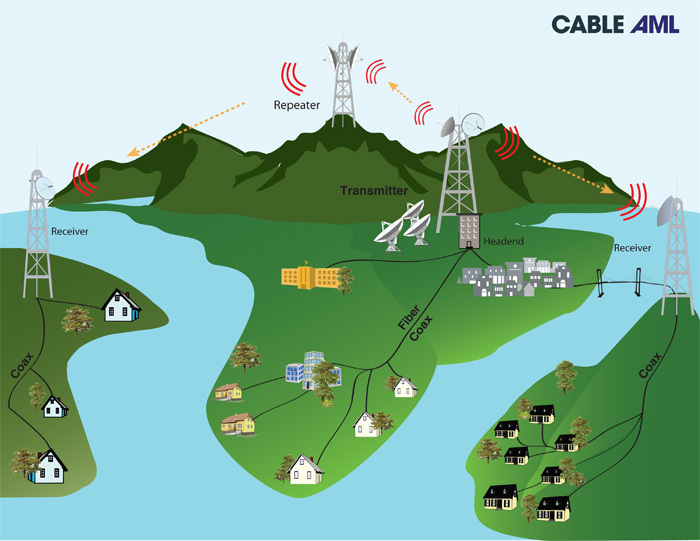 Multichannel Video Links for Cable TV are high-capacity microwave links designed to enable Cable Television Systems (CATV) to transport all of the video signals from the Headend to a remote location.Cable TV operators have long been using this cost-effective technology to expand their systems by bypassing natural or man-made obstacles such as lakes, mountains, buildings, or areas without subscribers. These links transport all TV “channels” whether they are FM audio channels, analog TV channels, or digital carriers (64 QAM or 256 QAM). 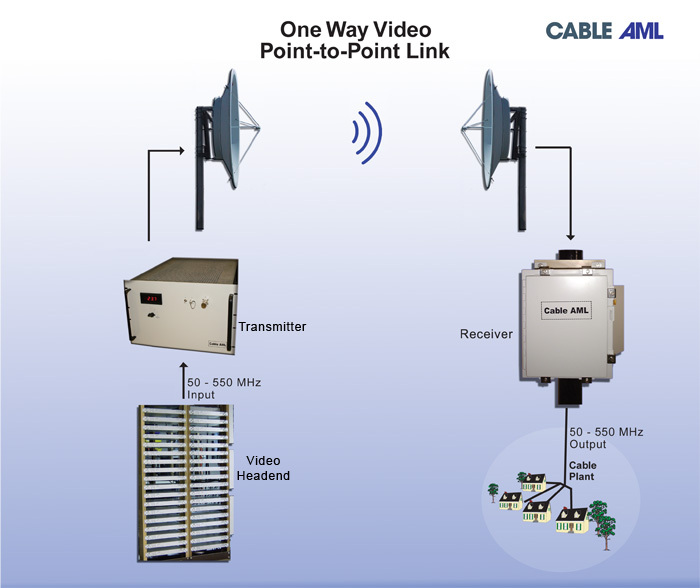 Cable AML video links can deliver CATV signals up to 60 Km with the same or better quality than fiber. Cable AML microwave systems consist of a transmitter with a dish antenna at the Headend site feeding a receiver at the remote end. Because the receiver directly feeds the trunk cable system at the remote location, there is no need for interface equipment or facilities at the receive site. AML is a line-of-sight technology. 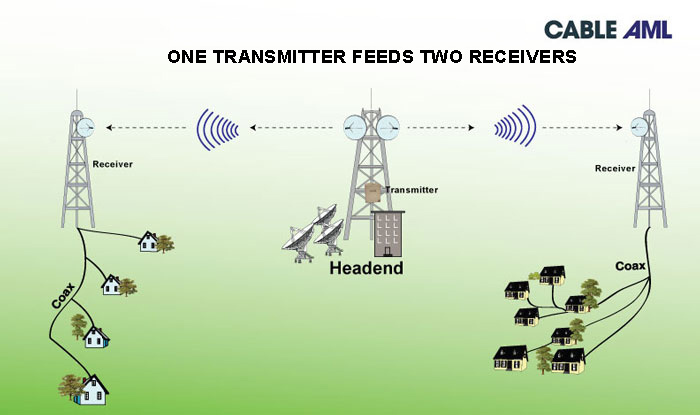 If there is no line-of-sight between transmitter and receiver, one or more repeaters can be used to complete the link. 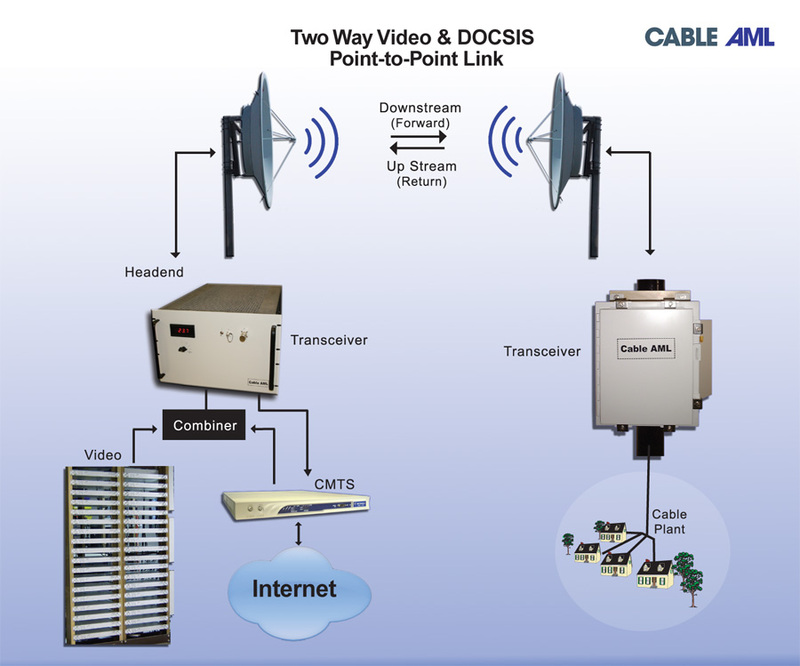 Multichannel video links for cable TV are also available with bi-directional capacity for systems that require a return path for transporting DOCSIS signals as well as other data carriers. Unidirectional existing systems can be modified by adding a return path, which is achieved by adding a header and a receiver in return transmitter in the reception site. The return path is designed to transport the DOCSIS header signals with QPSK 16-QAM or 64 QAM. In some cases the return transmission spectrum used in the band from 13 GHz down. Other versions use in the band of 13 GHz and return in the 18 GHz. The configuration of dual band 13/18 GHz provides a substantial capacity to return data and simultaneously provides additional downstream capacity without sacrificing the band width of the existing system. Both versions are available with various power levels and configurations transmitted indoor or outdoor installation.